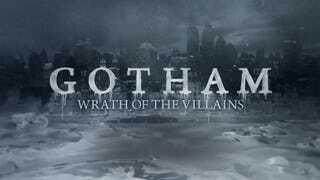 Gotham Season 2 Episode 18 - "Wrath of the Villains:Pinewood"
This week the hunt for the man behind the Wayne murder curtain intensifies and we learn of Thomas Wayne’s hidden secrets. On top of that, Barbara tries to get back with Jim and we have a return of The Master ERRR I mean The Lady, a totally different non Doctor Who charactered played by Michelle Gomez. Spoilers ahead! This episode was very top heavy, in that everything was centered around finding out who was behind the hiring of Matches Malone to take out the Waynes. Without Penguin or Riddler the weight has to be carried by Jim and Bruce. with a bit of Alfred and Barbara. Overall I thought it was done well. Barbara had some nice moments and while I don’t trust her, I don’t hate her scenes, at least for now. I don’t know if she is really redeemed or if she will still slip back into her old ways. She sure went back into the murdering psycho character easily enough to fool The Lady. I loved that they brought that character back, played by the always delightful Michelle Gomez. In my headcanon this is just The Master during a time period between the first time The Doctor sees her in this form and the second time. In between she was just messing around in Gotham City. I also liked what Bruce brought to this episode. We saw him display leadership and take command in a way he hasn’t done in the past. I liked his maturiry atlearning that Pinewood was his father’s idea but that he had other plans for it than what it became. The scene at the end where he learns that Strange, his friend was behind his murder was powerful. “HE WAS HIS FRIEND”. It comes off as a bit naive but it reminds us that Bruce Wayne is still a child. I liked the relationship he started to form with Karen Jennings, the lab rat who Thomas was supposed to meet with to discuss the reactivation of the Pinewood project. She and Bruce had some nice scenes and it was really heartbreaking seeing his reaction when Freeze took her out to silence her for Strange. I didn’t like that Karen had to die. I know she played her part and would be a liability for Strange but I would have liked to see her stick around longer. We learn that Strange is the one who was behind everything and I called it from the start of the episode. He was “The Philosopher” who was the one Karen knew ran Pinewood while she was there getting experimented on. He seems to have discovered the formula for bringing back the dead, and used to bring back Theo Galavan who calls himself Azrael. I’ve read this is more a title than a name and the holder has a suit of armor and protects the Order of St. Dumas which we saw earlier in the season, and the armor we see next week. So does this mean other “dead” villians might be coming back now that Strange has had success with Patient 44? I am loving B.D Wong more and more. He brings so much passion to this part and this week he got to really sink his teeth into some juicy scenes. Once we start getting Strange more involved as his role in the Wayne murder is uncovered. I agree with Peabody, he better be careful that this doesn’t come back to bite him. I am still not impressed with Freeze. The CGI was better and the suit was nice but where was the iconic helmet?And if there was no helmet where were the head shots? I liked seeing Alfred get more into the action. The writers seem to finally remember that in the comics he usually has a military or special ops background. I loved how Barbara ended up with Tabitha and Butch. Remember that they were still around? Tabbitha was happy to have her girl back and Butch was just like “Huh”. I think he is pretty much the audience avatar. Azrael mentioned a sister. I suspect that means Tabitha will be back in action soon. Ah, “Pinewood.” It works on two levels: on one hand, Pinewood Farm sounds disarmingly serene and harmless. On the other hand, coffins were traditionally made out of pinewood and Gotham, of course, chose to go that route by introducing one of Wayne Enterprises super-secret black ops mutant factories and then killing everyone. It was sad. It also finally gave us some actual solid clues to work with as we follow Bruce and Gordon down the rabbit hole of office politics and assassination. Bruce wore the emo turtleneck. “Pinewood” was one of those episodes. The architect behind Thomas and Martha Wayne’s murder was revealed this week in “Pinewood” and...it was exactly who we assumed it would be. You know, ever since Hugo Strange was introduced in the midseason premiere and was revealed to be the mastermind behind the Indian Hill experiments that is. Experiments that Thomas Wayne tried to put a stop to, causing him to get killed. So the reveal wasn’t really a big reveal, and most of the episode involved watching Gordon, Bruce, and Alfred slowly figure out what most of us already knew, but it was still good to get all this out in the open. “Wrath Of The Villains: Pinewood” is basically two completely different shows crammed into one. There’s the first half of the episode, which sees Gothamembrace its more campy elements and mix them with its lighthearted gumshoe elements, creating something that’s at least fascinating, a weird concoction that wouldn’t be out of place in Hugo Strange’s facility. Then there’s the second half of the episode, when all the storylines dovetail into one, and things get silly and contrived. Balancing and mingling various tones has always been a struggle forGotham. This season necessitates that balance more than ever, as the show looks to create drama out of the investigation into the Wayne murders while also indulging in the campy fun of Indian Hill—the villains still have to wrath, you know. Like so much of this season, “Pinewood” can’t quite pull off the balancing act.